Like in the year 2003, sound cards manufactured in 2004 could be divided into two categories: entertainment and professional. The first one included cards suitable for the majority of users preferring realistic 3D sound in games and downloaded MP3 files with unusual effects. The second category of experienced users that was constantly growing included owners of high-quality acoustic systems (with a touch of Hi-Fi) as well as users demanding the high quality of digitization and music composers. Fortunately, 2004 brought products to satisfy both categories. September 2004. 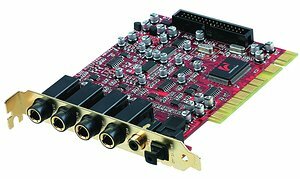 Two low-end products: PCI SoundBlaster Audigy2 Value and PCI SoundBlaster Live! 24-bit. Audigy2 Value wasn't worthy of close attention, being an Audigy2 modification without IEEE1394. But the latter card named simply "Live! 24-bit" could be considered unexpected and even sensational, as our tests demonstrated. At quite a moderate price ($35 and over for an OEM bundle), the card has DACs similar to those used in the top-end Audigy2/2ZS. And despite the understate specifications, it offered outstanding audio quality for its price, which was also confirmed by tests and auditions. Besides, it supported analog 7.1 channels, the real 24-bit/96kHz mode together with software EAX3.0 in games. This was an absolute leader in terms of price, quality and functionality. September 2004. USB1.1 SoundBlaster Live! 24-bit External. Key features: improved audio specifications and 24/96 support. October 2004. 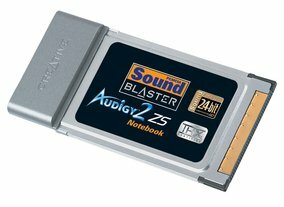 PCMCIA Sound Blaster Audigy 2 ZS Notebook. A very unusual product featuring analog 7.1ch output, 24-bit/192kHz support, 104 dBA SNR and EAX 4.0! November 2004. 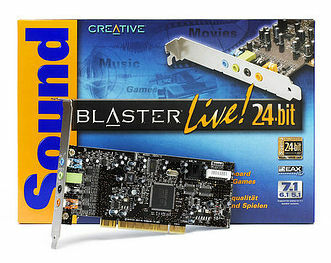 PCI card with an external unit - SoundBlaster Audigy4 Pro. Its only difference from Audigy2ZS Pro was higher-quality DACs (same to those used in EMU1212M, 1820M) and higher price. Automatically became the top model in the product series. No lite versions of Audigy4 were planned. 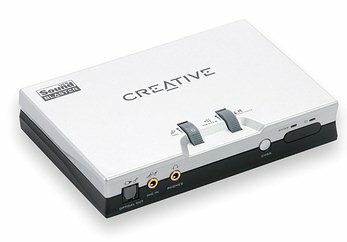 Besides, early in 2004 Creative suddenly announced the rebirth of the purely professional soundcard series from EMU (an integral subsidiary of Creative). 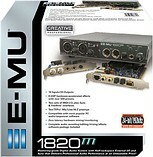 The newer professional E-MU series were designed by E-MU Systems in cooperation with Creative Advanced Technology Center, which implied the "Creative Professional" brand. The combination of price, quality and features introduced by the new cards stirred the entire PC audio community up became a reason of multiple discussions. Creative had only one chance to re-enter the market of professional cards and they used it, taking competitors almost by surprise! 1212M and 1820M models had almost shocking-quality converters and I/O specifications (confirmed by Audio Precision measurements! ), which surpassed even the specs of Lynx L22/Lynx Two. Novelties had the same ADCs as those used in Lynx and CS4398 DAC (an updated modification of CS4396; for more details read our E-MU 1820 Digital Audio System review). After these cards were launched, EMU updated the drivers to fix multiple flaws (for example, the previously absent support for high-definition formats for MME interface). Later on (when we finally laid our hands on 1212M soundcard, one of those featuring CS4398 DAC) the straight-forward censorious audio quality comparison in the balanced mode demonstrated that 1212M was not outscored by our reference card LynxTwo ($1000). Both cards performed identically great (at least with our $1500 studio monitors) and offered excellent quality, which was noticeably higher than that of other professional soundcards on the good speakers. Another vendor of audio solutions, M-Audio, was primarily focused on external USB and IEEE1394 audio interfaces in 2004. One of such, M-Audio FireWire 410, was thoroughly tested in our lab. On the one hand, it was no miracle and despite the external design the audio quality remained at the same level together with other semi-professional PCI soundcards from this company. On the other hand, its drawbacks (on the background of top-end devices) would only be noticed on a very expensive control sound path. So M-Audio FireWire 410 could be successfully used with low- and mid-end studio monitors like BX5/BX8 from the same vendor. 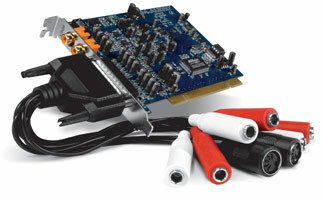 Among PCI interfaces one could notice the updated M-Audio Audiophile 192. According to the manufacturer, the higher-quality converters provided 113 dBA dynamic range and 0.0006% THD+N. The card had an interesting peculiarity - a separate monitor output besides the balanced TRS inputs and outputs. 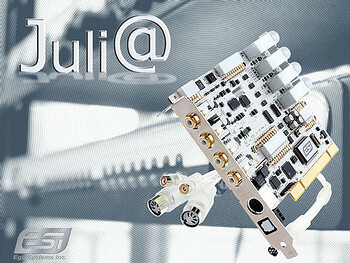 Speaking of Korean-Japanese ESI, in 2004 they launched ESI Juli@, a professional soundcard with pro and consumer interfaces. The original design implied a 180° rotating interface unit for more connectivity comfort and signal level selection (-10 dBV consumer or +4 dBU professional). The card also offered an interesting implementation of zero-delay hardware signal monitoring based on 8-channel DAC used for stereo output. For more details on this feature read our review and the exclusive interview with this product developers. 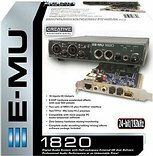 It was a successful professional device without reservations which offered EMU1820 audio quality at the moderate price of $150. ESI product features popular among E-WDM users were extended with DirectWIRE 3.0 support with more hardware inputs. ESI department of entertainment soundcards in 2004 released MAYA44 MKII, MAYA1010 and Prodigy 7.1 LT solutions as well as the newer drivers with QSound support for the fully-fledged Prodigy 7.1. Speaking of MAYA44 MKII, we must say it was a unique "all-in-one" value solution that even had a phantom-power mic-in and a separate high-quality headphones-out and was clearly designed for the entry-level professional equipment. The professional Envy24HT-S chip and two Wolfson WM8731 I2S stereo codecs were an example of a perfectly balanced design. The card didn't offer the record quality parameters, however it had a full set of professional features at a moderate price, unlike other soundcards that saved on external mixers. The only bottleneck we could think of were low-end converters. 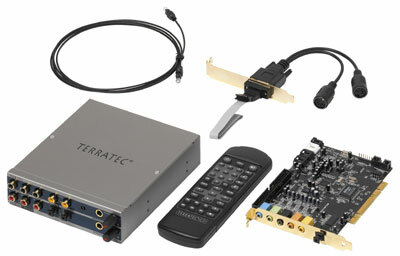 Terratec, in its turn, pleased its customers with Aureon 7.1 Universe soundcard that replaced the 6fire DMX, a very popular model in its time. Now the card supports 7.1 analog output, 192kHz mode. An infrared remote control was added as a home entertainment feature. As usual, it had Sensaura support. Let's also mention TerraTec Aureon 7.1 FireWire with its unusual orange backlight. Some of its interesting features include 8 analog RCA outputs, 24-bit/192kHz support, infrared remote control. Integrated audio in 2004 grew to the High Definition Audio (HD Audio), which succeeded to and evolved from AC'97 specifications. The new codecs had the same form-factor and are upward-compatible with HD Audio controllers. Probably following the "customers buy megahertz" principle, Intel named it after its key distinction - the support of high-definition audio formats). Read more details in our article Intel High Definition Audio — practical tests by the example of Realtec ALC880 codec. The integrated solutions based on High Definition Audio sound better than the modern integrated AC'97 codecs and 5-year old soundcards. 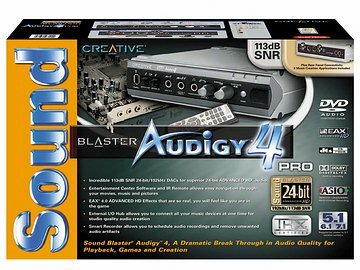 It offers quality similar to a 3-year old Creative Audigy, but still cannot catch up with modern Audigy2 and higher-end products. Thus in 2004 we were witnessing the evolution of AC'97 standard that received a new name of High Definition Audio and slightly improved hardware coupled with support for 24-bit/96-192kHz high-definition audio formats. Though it wasn't that necessary for the low-end segment, so we decided to pass this pass deliberately. The useful features include standard Universal Audio Architecture drivers from Microsoft and relatively ancient software audio for games (Sensaura, EAX2) with drivers from OEM codec vendors. Note that motherboard manufacturers were not too happy about this idea. Perhaps, HD Audio raised prime costs, while only a few really needed the quality and features of integrated audio. This way or another, there was only a handful of motherboards with HD Audio. At the year-end Creative has suddenly made a move in the integrated audio field as well (see The secret of MSI K8N Diamond news). Without any ballyhoo, the Web brought us information about nForce 4 SLI based mobos with complete features of the latest Low-End Creative SoundBlaster Live! 24-bit PCI card. Drawing up the bottom line, here are some words about our own achievements and the development of Audio.RightMark.Org in 2004. 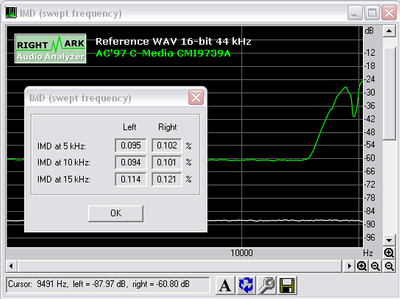 RightMark Audio Analyzer was considerably updated (the latest version is 5.4). This test has been developed by Maxim Liadov and Alexei Lukin. Alexei Lukin is one of the world's best experts in spectral analysis and digital audio processing algorithms. In 2004 RMAA obtained the DirectSound mode for testing 24-bit support in soundcards that only allow direct access to their hardware through DirectSound API. A new test was introduced for measuring intermodulation distortions with IMD swept sine. While the standard IMD test in Version 5.1 uses the SMPTE sine set, the newer test carries on more complex measurements according to the CCIF standard: a test signal of two floating sines with same amplitudes and 1kHz constant difference goes through the entire frequency spectrum, while frequency distortions are measured. This test also enables to detect the influence of intermodulation distortions on oversampling. We added a new option of signal normalization for cases when it's impossible to fine-tune measuring levels (and also to prevent measurement "cheats", when recorded signal level is reduced deliberately to obtain the lowest noise level). More added features include the separate measurements of the second and third harmonics in the acoustic system measurement mode; normalization of distortion to the amplitude level; frequency-dependent distortion measurement based on searching for gradually increasing constant-frequency sines. 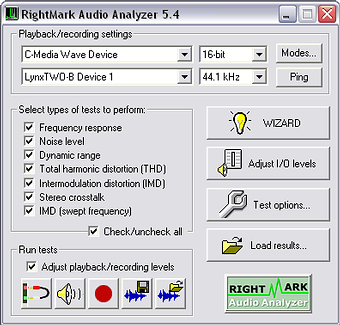 RightMark 3DSound, a unique synthetic test, was also developed in 2004. 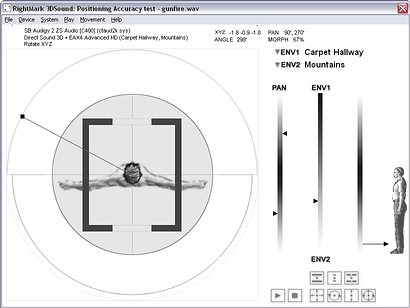 Now this benchmark is being developed by Maxim Liadov and one of the world-leading 3D sound experts, Alexei Menshikov. Alexei Menshikov took part in the development of EAX. We recommend you all read the unique material from the Game Developers Conference: Modern sound technologies in games. Checks the positioning quality of sound sources in DirectSound3D. You listen to the 3D scene with a moving sound source, which can be manually positioned in a 3D space. This test supports all the key features of EAX4 Advanced HD. Measures CPU load that depends on the DirectSound device operating mode. This synthetic test emulates the main cycle of a typical game sound engine. Aside from the standard DirectSound diagnostics, it checks the availability of EAX version support. XML-files can be opened in the data analyzer by double-clicking. Statistics it provides is used to exclude the influence of random OS activities and to obtain more information on the CPU load. It allows to obtain not only the average data values (expectation) but also their standard deviation. The unique method of statistical data processing with arbitrary partition law was developed by Maxim Liadov in cooperation with mathematical statistics experts from the chair of high mathematics of MSTU n.a. N.E. Bauman.